Subatomic particles are classified based on their mass, type of interaction and electrical charge. Classification based on the mass of the particles is the most basic way of understanding the subatomic particles. The following figure shows the classification of subatomic particles based on their mass. In this article, classification based on mass of the particles is explained. Hadrons are the heaviest particles. They are subject to the strong nuclear force and they are not fundamental particles as they are made up of quarks. This group is then split up into Baryons and Mesons. Baryons are the heaviest particles of all, followed by mesons. Pions and Kaons are examples of Mesons particles. Protons and neutrons are examples of Baryons. Baryons are subatomic particles made up of three quarks. The name “Baryon” comes from the Greek word for “heavy” (barys), because, at the time of their naming, most known elementary particles had lower masses than Baryons. As quark-based particles, Baryons participate in the strong interaction. The most familiar Baryons are the protons and neutrons that make up most of the mass of the visible matter in the universe. Each Baryon has a corresponding antiparticle (an antibaryon) where quarks are replaced by their corresponding antiquarks. Mesons are subatomic particles composed of one quark and one antiquark bound together by strong interactions. Because Mesons are composed of quark sub particles, they have physical size, notably a diameter of roughly one femtometer. All Mesons are unstable, with the longest-lived lasting for only a few hundredths of a microsecond. Charged Mesons decay, sometimes through mediating particles, to form electrons and neutrinos. Uncharged Mesons may decay to photons. Leptons are particles that are not affected by the strong force. These type of particles do not appear to be composed of any smaller particles and are, therefore, considered to be fundamental particles. 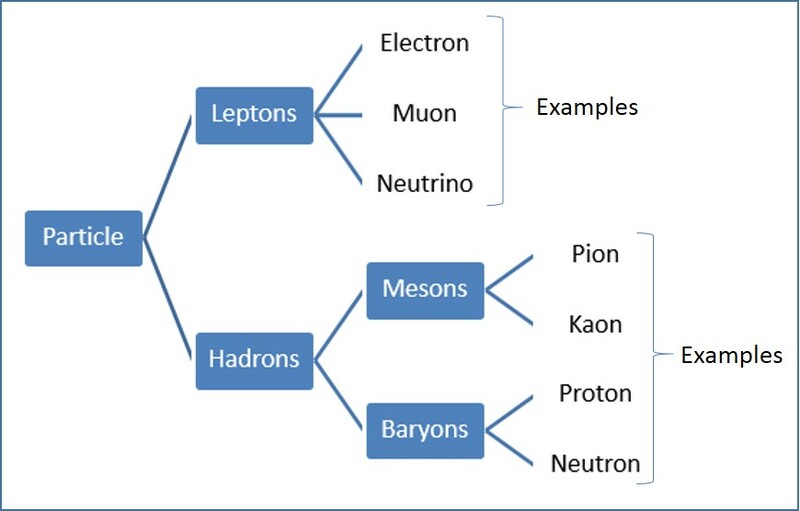 Electrons, muons, and neutrinos are some examples of Leptons. A Muon is an elementary particle similar to the electron, with an electric charge of −1 e and a spin of 1/2, but with a much greater mass. The Muon is an unstable subatomic particle with a mean lifetime of 2.2 μs, much longer than many other subatomic particles. Muons’ decay almost always produce at least three particles, which must include an electron of the same charge as the Muon and two neutrinos of different types. Like all elementary particles, the Muon has a corresponding antiparticle of opposite charge (+1 e) but equal mass and spin: the antimuon (also called a positive Muon). Muons are denoted by μ− and antimuons by μ+. Subatomic particles are classified based on their mass, type of interaction and electrical charge. Based on mass, subatomic particles are classified as Hadrons and Leptons. Hadrons are the heaviest particles and are affected by strong force. Baryons are subatomic particles made up of three quarks. Mesons are subatomic particles composed of one quark and one antiquark. Leptons are lighter particles and are not affected by strong force. A Muon is an elementary particle similar to the electron, with an electric charge of −1 e and a spin of 1/2, but with a much greater mass.